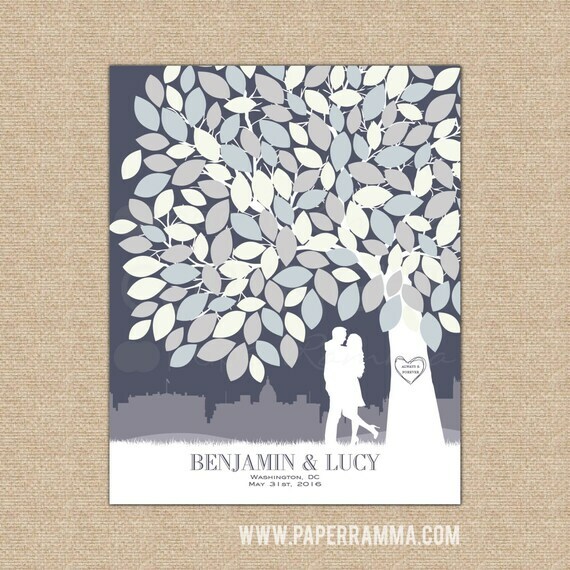 PaperRamma: custom guestbook, custom nursery art prints, creative travel maps & more... http://www.paperramma.etsy.com | Proud to be featured in HGTV magazine, & you can also find us on theknot.com! One of our Wedding Design Gurus would love to work one-on-one with you to customize this special guestbook for your upcoming wedding. A modern spin on a traditional concept, this art print is a wedding guest book – in the form of a beautiful art print which you can hang in your home. It is a memorable keepsake and reminder of your special day that can be displayed and cherished forever. Your guests will interact with this print by signing their name or message on each leaf. With leaf choices ranging from 50 to 200 leaves- this guestbook can accommodate up to 200 individual guests or 400 families/couples (400+ guests when signing as families/couples). We make it easy! Your purchase includes a FREE DIY digital file which explains how it works: to display for guests at the reception. • Your choice of city or landscape in the background- we have most major cities, and a variety of landscapes available (included), and can custom design custom landscapes, venues, or smaller cities (add'l design fee applies). • Your choice of colors: coordinate your wedding tree to your wedding colors, the decor in your home, or just about any color palette (included). --> Or, love the colors you see above? Ask for the colors "as shown"
Immediately after your purchase, you will receive a "Get Started, customize now" email containing your custom design form. Simply, reply with your customizations to customize your art. Then, your Design Guru will create your design based on your custom design form. P.P.S. Also note: We won't stop at just one proof- if you need additional changes, you can reply to your proofing email and we will send you back changes until your Print is "Hang-Ready!" We want you to absolutely LOVE your art (and tell all your friends too!). Choose your print size and type from the drop down menu when you add your item to cart. You have the choice of an "Art Print" or "Canvas Print". We take pride in our Premium Giclée prints- we only print using the best inks and luxe stocks. - PRINT: As-thick-as-a-business-card, matte paper Art Stock printed w/ rich, vibrant, archival pigment inks & sharp detail. - SHIP: Packaged with care & shipped in a premium mailer. We've chosen only the best luxe canvas options for our art- we steer clear of "bargain canvas". - PRINT: Stretched canvas, 1.5" gallery wrap, Rich, vibrant, inks w/ sharp detail. - SHIP: Professionally packaged with care & shipped in a premium mailer. - HANG: Ready to hang, no framing necessary. Standard orders typically arrive within 2-3 weeks from purchase date. Your PaperRamma purchase is custom made especially for you and includes the expertise of a dedicated Design Guru. This specialized process typically takes 2-3 weeks. Standard orders with tracking typically arrive within 2 weeks from purchase date. RUSH orders receive super fast processing and upgraded shipping. To add RUSH shipping to your order, add your item to the cart & choose the RUSH shipping upgrade that coordinates with your print type (art print or canvas).